Feminism is an ideology that aims to interrogate gender inequalities in order to create a society where men and women are of equal value and their equality recognized by all societies. In terms of women’s peace building, feminist analysis identifies women’s specific concerns about peace building approaches from women’s perspectives. This point of view recognizes that women throughout the world suffer from discrimination and oppression and have remained absent from peace building processes and negotiations. Women have also continued to organise and strategise on how to overcome such challenges and one of such spaces is the Isis-WICCE international Exchange programme that brings women from different countries in conflict and post conflict areas around the world to acquire knowledge and practical skills to effectively engage and take lead in peace building efforts. The 2011/2012 institute brought together 34 women from 11 countries in Africa and Asia. 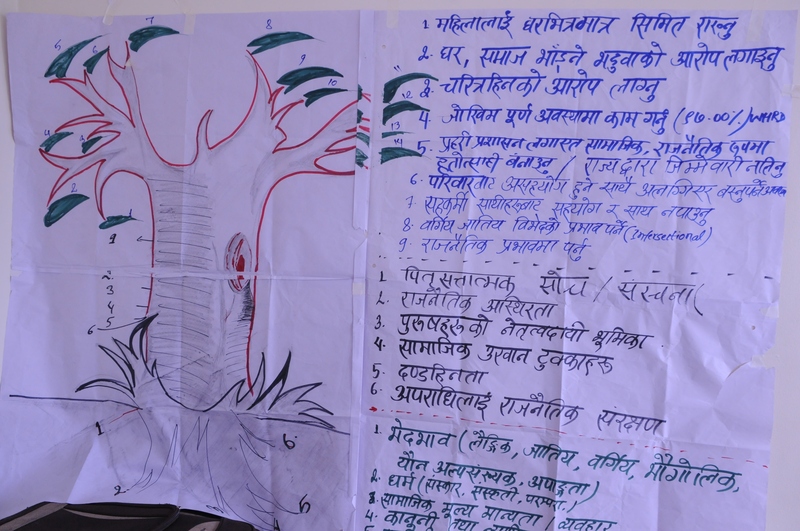 During the training on session on feminist peace building participants were taken through feminist analysis of their country research findings using a feminist tree. 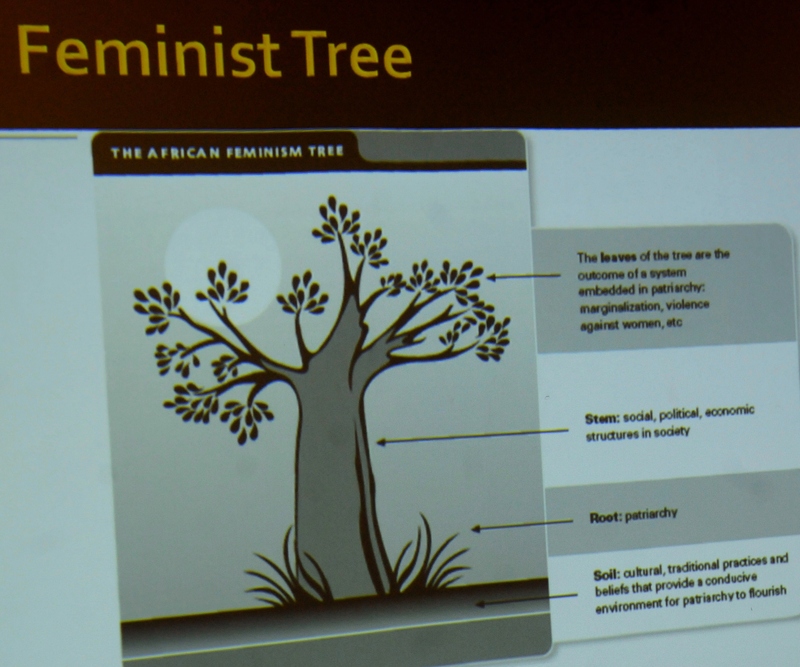 For the case of Central African Republic, the research focused on domestic violence and patriarchy, which represents the roots in the feminist tree. The violence was identified as a major issue which creates a situation where women are objectified, forbidden to eating specific foods like meat, and generally considered second class citizens. These women are also denied positions of power or the opportunity to speak during village meetings even on issues that affect women’s lives. The Ministry of Justice , Police and Local Administration were highlighted as some of the many social and political structures which are reinforcing violence against women. These are mostly dominated by male leaders who minimise women’s issues. For instance, the psychosocial departments in CAR do not function because men in these offices do not consider violence against women as a serious problem. In addition, the Ministry of Finance does not allocate sufficient financing to women and their issues because it is not considered a priority. This non-responsiveness has led to even higher instances of violence against women. 90% of the research respondents had experienced violence with 35% of the women physically assaulted and 50% suffering economic violence from husbands who spend the women’s earnings from agriculture on selfish pursuits. In the situation of Nepal, the research focused on the security and identity of women human rights defenders. The participants identified problematic religious beliefs, rituals and customs which are embedded in patriarchy as the cause of increased violence against women. These beliefs have posed a huge challenge to the work of women human rights defenders because woman should not talk in public and there are rules on how a woman should conduct herself. Religion also defines how women should be seen and represented. Women human rights defenders are therefore not recognised. The outcome of this is the discrimination against women, caste discrimination between women human rights defenders and discrimination in government’s approach towards rich and poor women. The Zimbabwe research was on the impact of dollarization on the economic status of women. It pointed out patriarchy as the major barrier with men acting as the household heads and demanding ultimate control of resources. The political space was also found to be dominated by men with access to information being controlled by patriarchal views. As a result, women are discouraged from participating in mainstream economy and denied property ownership. They are economically illiterate, relegated to the informal sector and not included in decision making. The outcome of this is that women have challenges accessing credit, lost savings during the dollarization process and ultimately lost trust in the banking system. The feminist analysis of conflict is essential as it reflects on the need of visibility ofwomen in conflicts and the realities encountered. It also brings out the interconnectedness of all forms of violence: domestic, societal, state based and inter-state and its gendered dimension. This helps to inform and influence peace building processes from a feminist perspective.